Uniform Jackets from 5.11 are engineered to provide lasting utility, comfort, and professionalism in any setting. 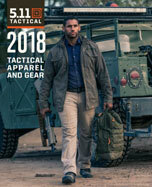 Designed to ensure a clean, crisp appearance without sacrificing tactical functions or durability, 5.11 duty jackets are loaded with user-drive features that allow you to maintain peak performance. From the enhanced biohazard protection built into our first responder jackets to the enhanced sidearm accessibility on our patrol duty parkas, 5.11 uniform jackets provide you with all the tools you need to excel in your chosen profession. Available in a wide range of colors and styles to suit any departmental regulations or requirements, and built to withstand the harshest climates and environments, 5.11 duty jackets set the standard for law enforcement, EMS, and fire services nationwide.